P. decided that we should go out for the day. So we headed up to the North Norfolk coast. 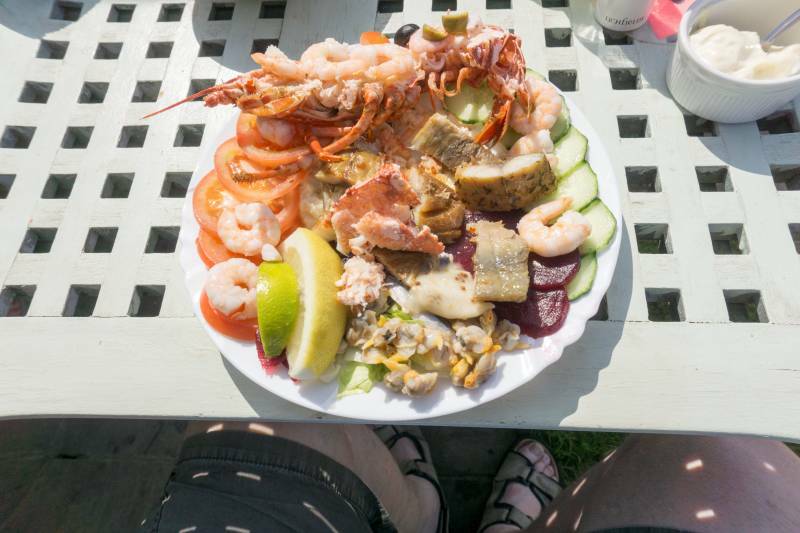 We stopped for a celebration meal at Cookies Crab Shop in Salthouse where I had a real luxury Lobster salad. Having had lunch we drove on to Sheringham and had a drink in the pub on the cliff above the beach. As we walked back to the car we passed Sheringham Little Theatre. On a whim we found out what was on that night. It was an amateur production of The Weekend by.Michael Palin, so we decided to stay. I said that it was an amateur production but it was very professional. Although a couple of the cast over-acted, the leads were excellent, especially given the large part played by the male lead. We thoroughly enjoyed it. We had intended to get some fish and chips after the play but all of the chip shops were closed so we ended up with a Kentucky Fried Chicken on the way home. A very enjoyable day.